FUJIFILM Corporation (President and CEO: Shigetaka Komori) is proud to announce the addition of a new premium compact camera to its digital camera line up for Autumn 2011. The X10 features a large 2/3" 12 megapixel EXR CMOS sensor and a high-definition F2.0 wide-angle and F2.8 telephoto FUJINON 4x manual zoom lens (28-112mm)*1 that is characterised by its brightness and superb picture quality right up to the edge of an image. The X10 is a highly advanced compact camera with specifications that follow in the footsteps of the sought after multi award-winning FinePix X100 (released in March 2011): the ultimate in refined design, components, functions and specification. Featuring a bright optical zoom viewfinder with a wide viewing angle, the X10 allows users to enjoy the pleasure of photography via a traditional viewfinder, providing all the benefits and ease of composition that this brings. The X10 features a newly-developed high-definition Super EBC FUJINON*2 lens which achieves superb image clarity over the whole of the image. The lens consists of 11 glass lens elements in 9 groups, including 3 aspherical glass lens elements (6 sides) and 2 extra-low dispersion lens elements. The result is an ultra bright lens with a wide-angle maximum aperture of 2.0 and telephoto maximum aperture of 2.8. With its all-metal lens barrel you are guaranteed a smooth zoom action which helps you compose your photos quickly and easily. In addition the camera's power switch has been deftly built into the manual barrel zoom to facilitate fast responses and to help you avoid missed photo opportunities. The lenses are designed by R&D of FUJINON who has a long-term experience to supply a majority of professional broadcasting lenses. Fujifilm's engineers have used an arrangement of 3 aspherical lenses plus a special dach prism configuration to deliver a viewfinder with superior brightness and a superb field of view with its extra wide viewing angle, and all whilst still maintaining a compact camera size. This, combined with the Manual Barrel Zoom functionality, makes a real difference and brings a welcome old-style photographic feel to the X10. The X10 features a newly-developed large 2/3" 12 megapixel EXR CMOS sensor with approximately twice the sensor area, and approximately 2.5times the pixel area, compared to existing Fujifilm camera models*3. This bespoke EXR CMOS sensor combines Fujifilm's proprietary EXR technology (which can select the optimum shooting mode from the three options below SN / DR / HR), with CMOS technology to provide bright, sharp images in all shooting conditions. SN High Sensitivity and Low Noise mode - produces clear and sharp high-sensitivity images whilst keeping the noise levels low, and is an ideal choice for capturing night scenes or indoor situations with poor lighting. In addition the X10 features a high-speed EXR CMOS and EXR processor which facilitate high-speed continuous shooting at up to 7 frames per second at the full 12 megapixel resolution (L size), and 10 frames per second at the reduced resolution M size. Plus a 49-point matrix contrast AF which provides high-speed and high-precision auto focusing thanks to the fast CMOS capabilities and the advanced EXR Processor's AF system. With its super speedy shutter-release time lag of approx. 0.01 seconds, the X10 can capture even the most fleeting of photo opportunities. And it's also worth mentioning that it features best-in-class*4 1080p Full HD movie recording capabilities. Manufactured from strong, yet lightweight, die-cast magnesium alloy, the X10's upper control deck and camera base are perfectly designed and add a real sense of style and glamour to the camera. On top of this the exquisite notches of the exposure compensation dial and the satisfying torque feedback produced by the hidden metal ball in the click-stop mechanism ensure the quality of craftsmanship is truly apparent. The X10 not only offers "EXR Auto" intelligent scene recognition (which adjusts camera settings to suit sunsets, blue skies, greenery, beaches, snow, etc. ), and also detects people and identifies difficult to photograph backlight conditions, but now, it even has the ability to detect subject movements. The intelligent EXR CMOS Sensor automatically selects the optimum shooting mode from of a total of 99 different variations, this enables it to capture any kind of scene perfectly in even the most difficult shooting conditions. For those of you that like to experiment, the X10 offers Fujifilm's unique Film Simulation modes, reflecting the company's background in photographic films. Eight setting are available, including Velvia / PROVIA / ASTIA which allow you to reproduce the well-known tones of highly popular color reversal films, as well as X10 expands the scope of photo expression with Monochrome Mode that can be fine-tuned with R / Ye / G filter settings. In addition to Auto White Balance, the X10 provides a choice of 9 white balance presets to compensate for the color of different light sources. Users can also set a Custom White Balance using a grey card or other surface, or select the optimum Kelvin value. The X10 also features detailed image adjustability settings with options including “Color” to adjust color strength, “Highlight Tone” / “Shadow Tone” to adjust contrast in highlight / shadow sections, and “Sharpness” to sharpen or soften pixel edges. Finally there is a Noise Reduction Adjustment function to set the strength of noise reduction at five different levels according to the users' emphasis on whether to prioritise high resolution or low noise. To perfectly compliment the look and premium quality feel of the X10 camera body, a retro leather “quick shot” case with matching strap has been designed which fits the X10 like a glove. Made out of luxurious leather it has been thought out with uncompromising attention to detail, ensuring the ultimate ease of use and practicality. Precision milled from metal, the lens hood with adapter ring will be available. The adapter ring is also compatible with commercially sold 52mm filters and lens caps. EF-20 (Guide Number:20) and EF-42 (Guide Number:42) are compatible with the X10. I like this promotional video. Very professional and seduicing for X10 purchase. 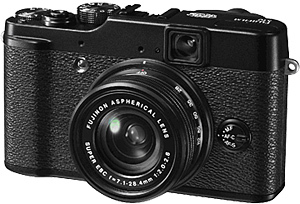 Re: Fuji releases the X10. What a cute little camera. This might be mine. I saw the Fuji guys presenting it and I, too, am looking to buy it. But it all depends on the usability. Fuji is not known for speedy AF or writing speeds. But the colors are usually brilliant. As sensor tech moves on, the smaller sized sensors seem to get better and better. And all this for 530 euros 'with' a F2.0 zoom lens. Very nice, Rita! Have you preordered your X10 already? I went for the Canon S95 in the meantime, couldn´t resist since I could buy it new for 280 Euros. pam.meier wrote: Very nice, Rita! Have you preordered your X10 already?. So, Rita, have you gotten your X10 already? pam.meier wrote: So, Rita, have you gotten your X10 already? Fujifilm's EXR technology was first introduced back in 2009 in the F200 EXR. The X10 uses a considerably larger sensor than the F200 did and one based on CMOS, rather than CCD technology, but the underlying idea is the same: to create a sensor that can be used in a series of ways to improve its resolution, dynamic range or noise performance. There are two aspects to this design: a sensor where alternate rows of photosites can be read separately, giving you the option of treating the chip as if it were two interleaved sensors, and a color filter pattern designed to make the most of this capability. Close up only works at 28mm, for the rest you need 50cm from the lens. Also the pictures aren't any better than my F10, only bigger... RAW is nothing for me. I had high expectations but after all I find it even more highly overpriced. Well, good you could return it.